Bobby Orr may be hockey's greatest player. He is also incredibly shy and fiercely protective of his image. So when news broke that he was coming out with his own autobiography - Orr: My Story - I was not too excited by it. Said Orr in a Boston Globe interview "I'm like most people in that over time I've wanted to write down my thoughts, make sense of many things I've seen, and share some things I've learned. Having played in the National Hockey League doesn't make me a better person than anyone else but it does mean that I've met some interesting people and been through some experiences I think are worth putting on paper. This moment in my life seems the right time to do just that." For those of us who have followed Orr over the years, you know this is very much Orr's story as he wants it to be told. There is not much earth shattering material in this book, aside from an interesting footnote on the controversial hit by Pat Quinn on a young Orr. For the most part this is, as expected, as carefully protective story in the image Bobby Orr has always wanted: Hockey's nicest guy. 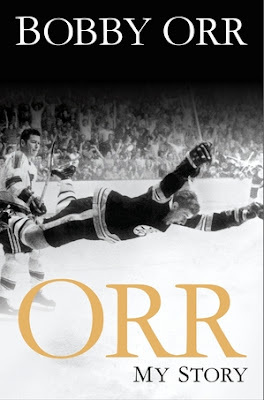 Orr, of course, is arguably the greatest player who ever played the game, and that makes this book perhaps the most anticipated book of 2013. Orr completely transformed the way hockey was played, taking it from a game of grinding defence to a rushing, high-scoring affair. Along the way, Orr set scoring records, won individual awards, and led his Bruins to two Stanley Cups before a bad knee sidelined him far too prematurely. For younger fans this will be a great introduction to a true hockey legend. Too many years have gone by since Orr last played, and too many fans do not realize just how good he really was. For the uninitiated this is an excellent choice. I especially like Orr's recurring theme that hockey is supposed to be fun and that kids nowadays need to the chance to learn the game rather than be taught it. Orr's message is as much for the parents as the kids. That being said the seminal hockey book on Bobby Orr will likely always be Stephen Brunt's 2007 masterpiece Searching For Bobby Orr. Once you have completed Orr's memoir, you really should do yourself a favor and read Brunt's bio. Available on October 15th, Orr: My Story is listed at $32 (Canadian) but sells around $20.